I did this page early on before I’d started to plan my graphic memoir-in-progress The Facts of Life. I was experimenting with media and styles. I like the pencil and ink look but have since decided on acrylic paint and ink for this project. Pregnancy loss as subject matter is taboo and will make some people feel uncomfortable, but it can be rewarding, and possibly useful to others, to communicate such experiences. Call it catharsis if you want; I hope that it ‘speaks’ to someone as well. I’ve chosen comics as a medium because I feel that visual communication has more to offer than prose alone. This probably comes from my involvement as an illustrator of children’s books where images are as important as the written word in storytelling, if not more so. This page deals with being in hospital during a suspected ectopic pregnancy. 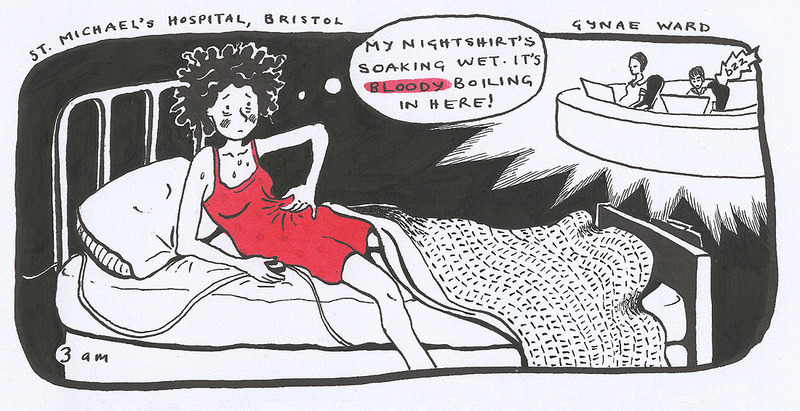 I’ve since come to realise that the nurse in my strip was probably overworked and over-tired on a long night shift. I imagined what she might be thinking, but I can’t be sure what was going on in her head – it could have been totally unrelated to my calling her. Nevertheless, her response affected me in a negative way. I’m using ‘author’s truth’ in place of not being in a position to ask her. Sometimes you just have to make it up. I think this is one of my images that Paul Gravett used in his keynote speech last year at Comics and Medicine: The Sequential Art of Illness. This entry was posted in comics, graphic medicine, graphic novels, The Facts of Life and tagged Art, comic strip, comics, comics and medicine, ectopic pregnancy, Graphic Medicine, gynaecology, hospitals, illustration, nursing, pregnancy loss, sequential art by Paula Knight. Bookmark the permalink.